When Toria and her parents move to the quiet town of Brompton-on-Sea, the worst part for Toria isn't leaving her friends behind - as most of hers are on the Internet anyway - it is that dreaded first day of school and trying to figure out which group, if any, she belongs to. She isn't a popular kid, music geek or the sporty type and so she's fully prepared to spend the remainder of her school days in solitude. That is, until she meets a group of kids in her new school that don't seem to belong to any of the traditional groups; they're the misfits. They're not all World of Warcraft-playing nerds or math whizzes, they're teenagers that simply don't belong anywhere else - just like Toria. The unofficial leader of the gang, Polly, may not be a stereotypical teenager, but she couldn't be called a misfit either: she's the coolest person Toria has ever met. And she's desperate to fit into this group so she can hang out with Polly all the time. But when romantic relationships start to triumph over friendships, it becomes difficult to keep the gang together. And when Toria herself realises she has conflicting feelings for people in her friendship group, she needs to make the choice between what is expected from her and what she really wants. James Dawson is the Queen of Teen for a reason. His horror novels aren't only incredibly fun and exciting to read, they're jam-packed with interesting and - more importantly - diverse characters, something that unfortunately still isn't always the case within the young adult genre. 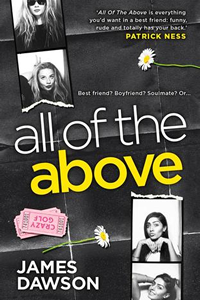 After the thrilling Cruel Summer, Say Her Name and Under My Skin, James' latest novel, All of the Above, is completely different from his other books in that it's a contemporary romance without supernatural elements, yet it also feels very familiar, as it's filled with his signature mix of compelling and very realistic 21st century teenagers. I read a lot of YA and while there are plenty of characters I've come across that are memorable and I love (or love to hate), none are as genuine and convincing as those written with Dawson's distinct voice. That may not always make for easy reading, but that is what makes them and their stories so realistic and interesting. Toria actually initially comes across as the least real teenager of the group of friends in All of the Above, but I think that mainly stems from the fact that she doesn't show her true self until much further into the novel. When she does, it instantly makes her a more likeable character (not that a character has to be likeable, but she was!) and one I rooted for until the end. This wasn't all about Toria either and Dawson really nailed this eclectic group of kids being drawn to each other in the dead seaside town; they make their own entertainment while working hard and helping each other to achieve bigger and better things than is expected from them. It's a positive message to give teenagers reading the book. Not only about being true to yourself, but also that if you work hard for what you want you can do almost anything. It's inspiring that a novel that doesn't shy away from tackling difficult issues, which today's teenager unfortunately all too frequently have to deal with, holds such an uplifting and motivating message as well. All of the Above is a refreshingly honest portrayal of the struggles that accompany growing up in the 21st century and embracing who you are. It's a novel that every teenager - and adult - should read. Many thanks to the publisher for an advance copy of the novel in exchange for an honest review!